Herpetologists at The University of Texas at Arlington have described a previously unknown species of snake that was discovered inside the stomach of another snake more than four decades ago. The new snake has been named Cenaspis aenigma, which translates from Latin as "mysterious dinner snake." It is described in a recent paper in the Journal of Herpetology titled "Caudals and Calyces: The Curious Case of a Consumed Chiapan Colubroid." The paper was co-authored by Jonathan Campbell, UTA professor of biology; Eric Smith, UTA associate professor of biology; and Alexander Hall, who earned a UTA doctorate in quantitative biology in 2016. The researchers' work identifies Cenaspis as not only a new species but also an entirely new genus. The specimen was found in the stomach of a Central American coral snake—a species that has been known to eat smaller snakes—by palm harvesters in the southern Mexico state of Chiapas in 1976. The 10-inch long specimen was preserved in a museum collection. Amazingly, a live specimen has never been found in the ensuing 42 years. "This small snake was obtained now over 40 years ago, and the report of its discovery has been a long time in coming," the co-authors wrote in the Journal of Herpetology paper. "We were optimistic that additional specimens might be secured, but after at least a dozen more trips into the region spanning several decades, we have been unrewarded." Cenaspis has several unique features that defy placing it in any known genus and clearly distinguishes it from all known genera. These include undivided subcaudal scales, or enlarged plates on the underside of its tail; a lack of spines and presence of cup-like structures called calyces on its hemipenes, or paired male reproductive organs found in snakes and lizards; and the shape of its skull. The first two of those features are not found in any other known snake in the family Colubridae in the Western Hemisphere. Colubridae is the largest snake family and includes just over 51 percent of all known living snake species. Utilizing the vast resources of UTA's Amphibian and Reptile Diversity Research Center for comparative purposes, the researchers made CT scans of dozens of specimens of snakes. 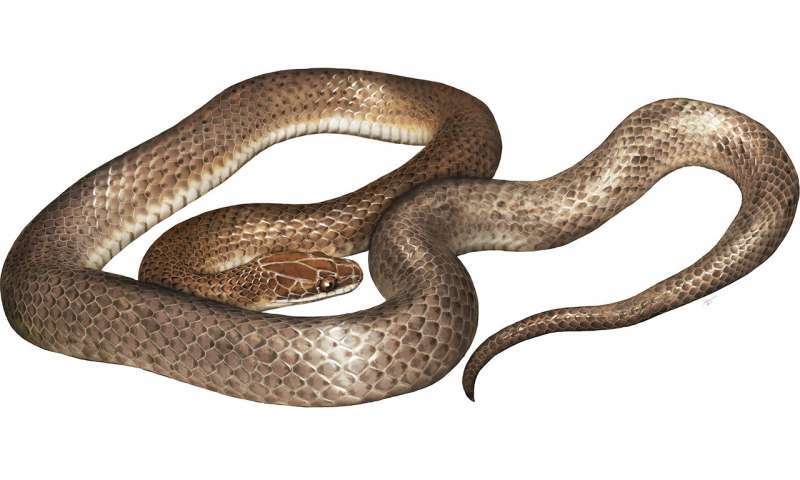 The biologists believe that due to some of the specimen's physical features, Cenaspis is likely a burrowing snake that feeds on insects and spiders. Campbell believes that Cenaspis is not extinct but has eluded capture due to its burrowing lifestyle and other elusive habits. "This provides evidence of just how secretive some snakes can be," Campbell told National Geographic, which ran a story about the discovery in its Dec, 19, 2018, edition. "Combine their elusive habits with restricted ranges and some snakes do not turn up often." He noted said that because of the snake's unique nature, the Chiapas highlands area of southern Mexico where it was found all those years ago should be considered for protected status, so that more unknown species can be discovered and not face possible extinction.